A great drive pedal that nails the Orange sound - but perhaps a little on the pricey side. Superb build quality. Excellent emulation of the Orange stack sound. Proper parametric EQ. 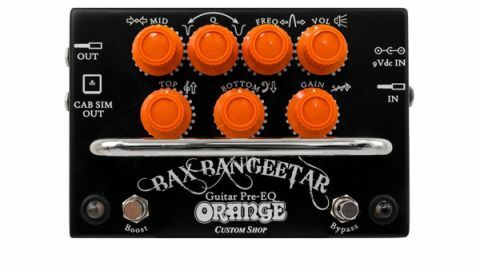 The first Orange stompbox since the 1960s, the wonderfully named Bax Bangeetar is built in the UK and a substantial pedal in every sense of the word. Analog hand-wired electronics inside a heavy-duty steel box are connected by an awful lot of wiring, which is carried out to Orange's usual high standard. All in, the Bax Bangeetar is a superbly built product that will last and last. "In use, the Bax sounds just like an Orange stack, with the same dry, verging on fuzz-box distortion that typifies the Orange sound"
The Bax's controls include knobs for volume, gain, bottom and top. The all-important midrange is taken care of by a proper parametric EQ with controls for cut/boost, Q and frequency. There's a regular output and speaker-emulated out using Orange's CabSim circuitry, with two footswitches for bypass and boost, while the outsized LEDs indicating effect on and boost are blue and green. In use, the Bax sounds just like an Orange stack, with the same dry, verging on fuzz-box distortion that typifies the Orange sound. The parametric mid makes it easy to dial in any guitar for the perfect tonal balance, the switches operate silently, and the CabSim output does a great job of imitating a 4x12. The Bax will give you every colour of the tonal spectrum, from orange to orange - players after other amp tones might be a little disappointed, but for replicating the archetypal Brit-rock sound, the Bax Bangeetar is superb. It's a little on the pricey side, but for a custom hand-wired pedal of this caliber, it's worth the outlay.